While the calendar says that fall has almost arrived, the temperature where I am today doesn’t feel like it! However, I do believe the mornings and evenings are a bit cooler than they were which gives me hope that the days soon will be, too! There are certain foods that signal the arrival of autumn at our house. They are mostly simple, delicious comfort foods, those that were too hot and hearty to eat on toasty summer days, but are just right for nippy fall evenings! 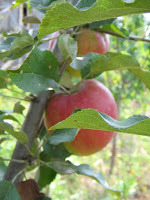 I guess you can tell that apple dishes and soups are what I like to eat in abundance as the temperature begins to drop! Are there certain foods you enjoy eating at this time of year? Please share them with us in the comments section.This post is linked to Thursday 13. I love to eat soups and chili when the weather gets cooler. Don't forget the hot chocolate! Yum! Many of your favorites are mine as well. I, too, love soups and apples. Thanks for visiting me, and good luck writing at AC. Hopefully we can connect there as well! That's quite the yummy list. It is 80 and humid where I am so fall is still far from reality, I can't wait till it gets here. I haven't had venison in ages. Sigh. A delicious list! I'd go with the apple pies, homemade vegetable soup, beef stew…this is making me hungry. YummY! I'm all about fall flavors and smells!